Once your sketch is ready to export, touch the Export button in your workspace. The Export menu displays multiple file types you can choose from, to allow efficient bridging with your other apps and destinations. You’ll also notice a Region and an Options area. Your Region is the area you’d like to include in the export (since you have an infinite canvas to choose from). If you have an artboard active, you’ll see that region available, as well, and you can choose to export to your preset boundaries. Your Options include exporting with a transparent background, exporting with your current Paper type, and whether or not you’d like to include your Grid in your export. These options differ a bit depending on which file type you choose - go ahead and select to your desired outcome. 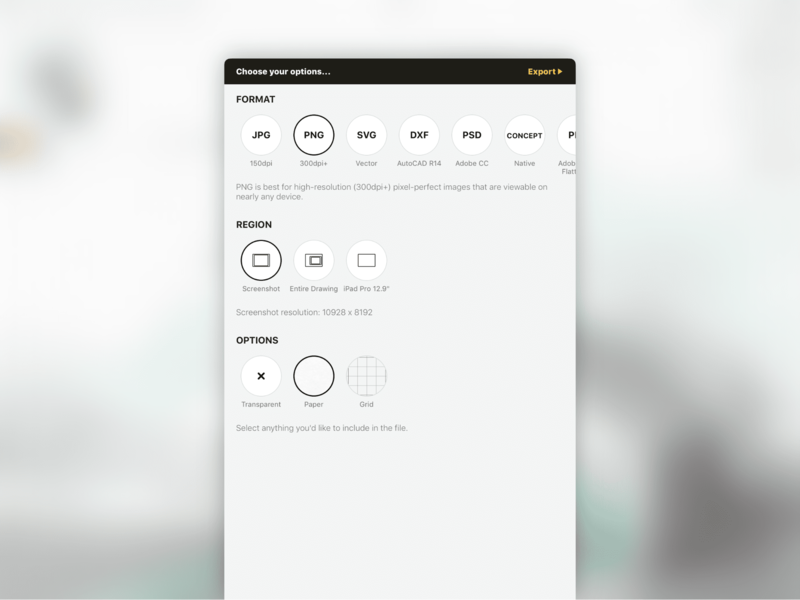 Standard, low-resolution export that’s best for quick emails or low-res screenshots. On iPad and iPhone it’s 72dpi, on iPad Pro it’s 150dpi. Standard, higher-resolution export for pixel-perfect images that are viewable on nearly any device. This is 300dpi up to a maximum resolution based on the device (4 times the screen size on an iPad Pro, and two times for other devices). A SVGstandard format for simplifed vector paths that include point data and colors, but is limited to a single line-weight per stroke and very rough texture support. Please be aware that not all SVG formats are equal between apps. In fact, they’re all different and proprietary, and you can expect to see inconsistencies between vector stroke appearances in Concepts versus other vector apps. Eraser marks will display as white lines. If exporting for Adobe Illustrator, make sure to uncheck ‘Filters’ in the options. DXF is a CAD format from Autodesk (R14) that includes vector paths and basic color representation, useful for organic CAD models and laser / waterjet cutting. Eraser marks will display as white lines. Adobe’s Photoshop format supports multiple layers in a raster (high-res PNG) format. This export type requires and exports to your Adobe Creative Cloud account. Concepts’ native file format. This format is best if you want to preserve your file’s unique vector-raster hybrid data, and continue editing the file on another device. Adobe’s PDF is an industry standard for cross-device workflows. This is the raster version that maintains look and feel but loses vector path data. Files can be quite large as they’re exported at high resolutions. Adobe’s PDF is an industry standard for cross-device workflows. This is the vector version that supports basic paths but loses the textured feel of your brushes. The link is copied to your clipboard and you can then share it via email, Airdrop or any other method. Clicking on the link will open it automatically inside Concepts as a new drawing. Please read more about exporting your PDF files here. 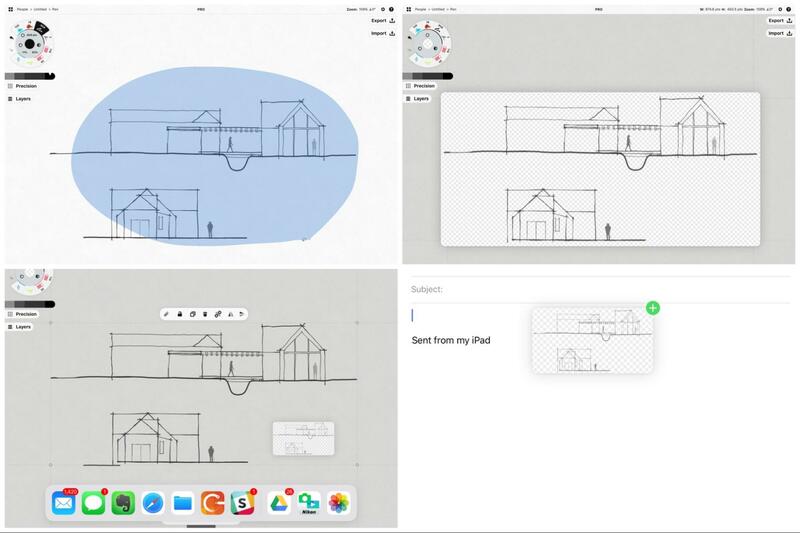 Concepts supports iOS 11’s Drag & Drop capability. You can drag & drop selections, images, text and colors both into and out of Concepts with supported apps. Images are exported in a transparent PNG file format. Using the Item Picker or Lasso, select what you’d like to bring to another app. Tap+hold your selection. It will pop out from the screen just like any drag & drop image. Start dragging your selection. Swipe upward on the tab with another finger to open your dock and choose your destination app, or have it ready to go split screen. Read how to drag & drop selections into Concepts here. You can attach selections, images, colors and text to your device’s clipboard, and paste them into email, text, supported document editors and other apps. To copy a selection to your clipboard, select your drawing, drawing portion, or object, and touch the Paperclip in the Selection popup or at the top of the Import menu. In your destination app of choice, tap+hold the screen and touch Paste.